The Gulf of Maine Visionary Awards recognize the contributions of people working to improve the health and future well being of the Gulf of Maine. Innovative and highly committed, these "visionaries" have spent years making the Gulf a better place. Each year, the Gulf of Maine Council gives two visionary awards to individuals or organizations in each state and province bordering the Gulf. Writer and river historian David Folster lives in a farming community overlooking Sugar Island in the Saint John River, named so because it was once covered with sugar maples. "It's very beautiful, like a piece of the prairie," he says, describing how the tip of the island marks the head of tide as well as the northern range of butternut trees. Folster was raised upriver in Grand Falls and knows the history of the Saint John intimately. With a group of friends he pioneered the Saint John River Society in the early 1990s, which grew out of a monthly breakfast group. "We started talking about doing something that would celebrate the river and champion its history and environmental integrity," he recalls. "The river links us to our neighbors in Quebec and Maine so it has this metaphor for unity. It's this uncommon river that we all have in common." With its source deep within in the interior of northern Maine, the Saint John River travels 673 kilometers (435 miles) to the Bay of Fundy on the New Brunswick coast, becoming the second longest river in North America (the Susquehanna is the first). The society took the concept of the river as a unifying symbol and distinct bioregion and went to work. Its many projects have included the creation of Christmas cards featuring paintings of the Saint John, a newsletter, and a topographical wall map of the watershed. For several summers, the society sponsored concerts extolling the river through stories and song, on the lawn of the Old Government House in Fredericton. Folster, who worked for 30 years as a print and television journalist, says he hopes to one day create a publication that will capture a piece of life in every section of the river he calls, "a thread in the quilt-work of cultures." 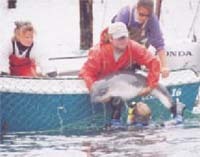 At left, GMWSRS's dedicated team rescues porpoises from herring wiers. Photo courtesy of Laurie Murlson. 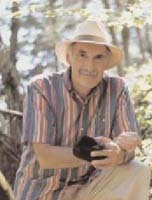 In 1969, Dr. David Gaskin of Guelph University in Ontario, began a long-term study of marine mammals and seabirds in the Bay of Fundy. Gaskin's establishment of the Grand Manan Whale and Seabird Research Station has led to significant advances in understanding the ecology of predators in coastal ecosystems, such as the harbor porpoise and Northern right whale. Opened in 1981, the station operates a program to help fishers release harbor porpoises from herring weirs and in recent years has assisted whale watch operators to develop and adopt a Code of Ethics to protect marine mammals and seabirds. The station has contributed to the Right Whale Recovery Plan in Canada and is part of an east coast network to track the migration patterns of the whales and to help those in trouble from fishing gear entanglements or other threats. A natural history museum at the station includes a collection of skeletons from sea mammals. Last summer the station received 10,500 visitors. Former students of Gaskin, who died of cancer in 1998, include Andrew Read of the Marine Laboratory at Duke University and Moira Brown of the Center for Coastal Studies in Massachusetts, who continue to work for the conservation of marine mammals along the Atlantic coast. Laurie Murison, a marine biologist and Gaskin prot�g�, now manages the station, which is located in a white clapboard house on the northeast shore of the island. She gives dozens of lectures each year to schoolchildren and adults and spends most of her summer days on board a whale watching boat conducting seabird counts, identifying whales and watching for signs of distressed animals. "It is very intense, trying desperately to look after the welfare of these animals," Murison says. "But our work is our passion and we regard it as our responsibility to ensure the safety of these highly mobile creatures." The Martha's Vineyard Shellfish Group (MVSG) was established in 1976 as an effort to stabilize and expand shellfish harvest in the six towns of Martha's Vineyard. Led by marine biologist Rick Karney, the nonprofit consortium distributes seed quahogs, scallops and oyster spat for grow-out in local salt ponds and embayments. Karney received his initial training in shellfish seed production at the Virginia Institute of Marine Sciences in the 1970s, but adds, "Most of what I've learned has been hands-on." He has painstakingly developed the techniques used to spawn shellfish in captivity inside the group's solar-assisted hatchery, constructed in 1980 during the energy crisis. There, shellfish are spawned and cultured through larval stages before being transferred to the group's shellfish nursery. Eventually, the juvenile shellfish are moved to field nurseries and throughout the waters of the member towns before being planted on public beds. In recent years, Karney conducted a shellfish aquaculture retraining program for fishermen displaced by fishing closures on Georges Bank. Several of them have since created their own shellfish aquaculture businesses. In addition, the hatchery has developed its own genetically-tagged scallops to track survival, interbreeding and population distributions when introduced into the wild shellfish communities. Through public education programs the group stresses the importance of shellfish as filters and indicators of water quality. "The shellfish feed on the natural blooms which therefore helps to keep waters clean," Karney says. "In other words, the more shellfish, the better the water quality." Making marine technology relevant to coastal management is foremost in Richard Langan's mind. Since 1997, Langan has served as co-director of the Cooperative Institute for Coastal and Estuarine Environmental Technology, a partnership between the University of New Hampshire and the National Oceanic and the Atmospheric Administration. CICEET uses the capabilities of the 25 National Estuarine Research Reserves to develop technologies and techniques that monitor and prevent contamination and habitat degradation in estuarine and coastal waters. "If a technology has developed that has real potential for use, what CICEET wants to do is put it into practice," he says. CICEET invites proposals from researchers that address the needs and priorities of marine resource managers. After an extensive review process, the institute chooses suitable projects. "Our long-term goal is to develop and make tools available for people to use," Langan says. "Whether that tool is an instrument, a method or a computer model, we're looking for something that makes decision-making and problem-solving that much easier." To date, the institute has funded 83 projects. In one, researchers designed an oil spill boom that captures and contains large spills of 100 gallons or more. The boom is highly applicable to waters with fast currents like the Gulf of Maine, Langan says. Another CICEET-funded project aims to replenish the decline of eelgrass by using a boat-pulled sled that deposits seeds below the surface of the sediment in estuaries and near-shore coastal areas. The next step after designing these prototypes, Langan adds, "is to transfer them into commercial use for a reasonable cost." For Vivien Li, keeping Boston Harbor open to everyone is a personal mission. As the executive director of The Boston Harbor Association (TBHA), she has played a defining role in shaping the renaissance of the harbor and supporting its natural, social and economic diversity by advocating a clean and accessible waterfront with a balance of uses. The nonprofit group, started 29 years ago by the League of Women Voters and the Boston Shipping Association, has fought long and hard for the harbor's clean up. With Li at the helm, TBHA's board has grown to include community activists, environmentalists, boat operators and developers. Despite their differences, Li says, they all have the same goal: to keep the historic harbor a clean and open arena. As the harbor has emerged as a highly desirable location it is her job to ensure that the interests of everyone, from developers to families mesh. Through sheer force of personality and hard work, Vivien Li has managed to disarm critics to meet the association's goals and build workable alliances. She has advanced several programs such as Back to the Beaches, which has improved and upgraded beaches that line the harbor, and HarborBound, an education program started in 1993 that exposes about 1,000 inner city high school students annually to marine environmental issues through boat tours of the harbor and Deer Island sewage treatment plant, lectures and water quality monitoring demonstrations. A marine debris program started two years ago removes litter, wood from piers and pilings, and other floatable debris from the Inner Harbor. The program now includes a component on prevention that reaches out to construction companies, developers and conservationists. "Our attitudes is: it's good to pick up the debris, but the real key is prevention," she says. Some 40 years ago a North Hampton conservationist named William Fowler began preserving small parcels of land along Little River Salt Marsh with the hope that the ecosystem could be restored and fully preserved. The coastal salt marsh is the largest in New Hampshire and one of the largest in the Gulf of Maine. Originally encompassing 193 acres (476 hectares) in North Hampton and Hampton, the marsh had been reduced to 170 acres (419 hectares), two thirds of which had been degraded by an undersized 48-inch culvert (1.3 meters) at the outlet to the Atlantic. The culvert restricted tidal flow and caused freshwater flooding during periods of significant precipitation. A growing number of residential housing developments near the marsh further altered the ecosystem. 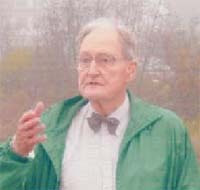 In the early 1990s, Nelson Burge, the chairman of the North Hampton Conservation Commission, began raising money to fund the restoration project and exploring partnerships with state and federal agencies. In stepped Henry Mixter. When he became chairman of the commission six years ago, he kept the momentum going, which led to a restored marsh and eliminated the flood risk for 42 households. In all, Mixter and the commission raised more than $70,000 (Cdn $115,500) in local funds to support the $1,250,000 million project (Cdn $2.06 million). The town also contributed countless hours of staff time to promote, administer and supervise the process. Completed in 2000, the restoration included replacing the 48-inch culvert with twin 6-by-24-foot (3-by-8 meter) culverts and dredging sediment out of the tidal creeks to facilitate both drainage and tidal flow. Within a year, the salinity level has doubled, a sure sign of the salt marsh's return. With more than a dozen agencies contributing, the Little River Salt Marsh project has become a model for similar projects all along the Atlantic coastline. Mixter says local conservation groups should not be daunted by large restoration projects, adding, "You have to get out there and swing. Otherwise you'll never make things happen." At right, sea caves at Chignecto. Photo: Andi Rierden. In 1982, Walton Rector, a local councilor, together with other citizens presented a proposal to the provincial government to establish a park at Cape Chignecto, which was privately owned and being intensively logged. The rocky peninsula, dominated by the Cobequid Hills, splits the Bay of Fundy into the Minas Channel to the south and Chignecto Bay to the north. Surrounded by high cliffs, it supports a rich fog forest ecosystem. Hard working and dedicated to preserving the land and to creating a better economy for their community, the citizens eventually saw their vision come to fruition. In 1989, the province acquired the land to establish what is now Nova Scotia's largest provincial park. Opened in 1998, Chignecto covers 4,200 hectares (10,000 acres) including 29 kilometers (18 miles) of pristine coastline. Cape Chignecto, however, is a provincial park in name only; it is solely community-supported. Today the people who worked to create the park, now manage it through the Cape Chignecto Park Management Committee. Their efforts to work with each other, with government agencies and the private sector have been called a model of cooperation for local communities. Rector served as the committee's first chair, a position he cherished, says his wife, Yula Rector. Those who knew him describe him as a down-to-earth gentleman with an irrepressible gift of persuasion. Born in Advocate, Rector had worked for years as a car salesman in nearby Amherst while his wife taught school. They moved back home after retiring in the early 1980s. "He retired but he kept on working," Yula says. "He just enjoyed working hard." During those years Rector fought successfully to bring a hospital and community center into the small town and have a through road to Amherst constructed. Then came the Chignecto proposal. "He was a community man and saw that a park was a good thing and never let up," says Ralph McLellan, who now heads the management committee. "Everybody looked up to him and listened to him. He knew how to deal with people and wasn't afraid to talk to anybody." At the park's dedication ceremony in 1998, Rector along with Ruth Allen and Stan Spicer (both former presidents of the management committee) received special recognition for their leadership during the years of planning and developing the park. Rector died a short time later. Recalling her husband's reaction to the ceremony, Yula says, "I think that was one of the best days of his life." Under the guidance of the management committee, the park's revenues have increased each year, a new visitors' center and 60 kilometer (40 mile) coastal trail, campsites and wilderness cabins have been constructed. Last year, more than 2,300 people visited Chignecto from throughout Canada, the U.S. and 19 countries overseas. "It's been a long haul," McLellan says, "But well worth it." Among school children in coastal Maine, "Puffin Pete," a.k.a. Peter Salmansohn, is the man�the bird man, that is. The engaging school outreach program on marine birds and ocean ecology he created in 1997 has reached more than 6,000 students in dozens of Maine classrooms. As the education coordinator for Project Puffin, the renowned seabird restoration program, he combines classroom visits with boat rides to view puffins, terns and other seabirds at Egg Rock Island. During the summers, he teaches children, adults and entire families at Hog Island Camp in Muscongus Bay how to take care of the natural world as individuals and by working together. Salmansohn also leads boat tours to offshore puffin and tern colonies. It all began through an internship program at the Audubon center in Sharon, Connecticut in 1979 where he trained as a naturalist. Ever since, Salmansohn has lived life as a consummate teacher. 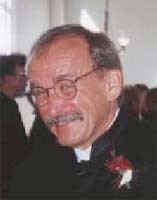 In 1998, he received the Environmental Educator of the Year by the Maine Environmental Education Association. And this summer will mark his 22nd year at Hog Island. Many of the individuals he taught as youngsters have gone on to work as field biologists, a sure sign that his approach has made a lasting impression. "I've found that it is more important to reach people through their emotions than through information," he says. "The more we expose kids to going out on the mudflats, tide pooling, sitting in a quiet spot under a spruce forest or going on a night hike and seeing the stars and listening to the owls, the more ingrained a love and respect for nature becomes." Salmansohn is a co-author with Stephen Kress of Project Puffin: How We Brought Puffins Back to Egg Rock, (Tilbury House 1997). He has recently designed a seabird outreach program on cormorants, coming to classrooms in Maine later this year. 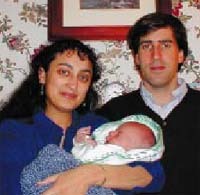 Sonja Sundaram, a geologist-geographer and native of Maine, met her husband Ben Walter, a marine biologist, who was raised in England, while they were both doing research in Bermuda. Together they have renovated a former sea captain's house, built in 1860, and the old inn next door to create the Oceanside Meadows Inn and nature preserve. Located at the head of Sand Cove in Prospect Harbor near Acadia National Park, the 200 acre property encompasses ocean frontage, fields, woods, salt marsh, rocky shore and a white sand beach and dune system that forms the head of the cove. Sundaram, who was raised on the Blue Hill Peninsula, purchased the sea captain's home in 1987, "before real estate prices really increased," she says. Over the years, the couple bought additional parcels and threw themselves into restoring the historic buildings. They opened the inn and natural preserve to support their efforts and to educate the public about the marine habitats of coastal Maine. She attributes her conservation principles to her parents, who opened the first wellness clinic in Maine and stressed the importance of community-service. "As a child I was taught that you must always work to give back to your community," she says. The couple is dedicated to preserving the land for perpetuity. The inn supports a rigorous recycling program and organic gardens. In 1998, the couple opened the Oceanside Meadows Institute for the Arts and Sciences in a 19th century timber framed barn. During the summer it hosts a series of free lectures that have featured an ornithologist, astronomers and a wildlife rehabilitator. Other activities include musical performances and seminars. As inn owners and environmental educators who encourage guests to explore the Schoodic region, the couple's nature-based business is also benefiting the local economy. "We believe in spreading our good fortune," Sundaram says.